I love red wine, especially a good Pinot Noir but, unfortunately, it doesn’t always love me back. Earlier this year I woke up at about 3 am with a racing heart rate and I freaked out. Heart conditions run in my dad’s side of the family and I’m only 26! Despite my chest feeling like someone was playing the drums in there, I eventually managed to get back to sleep and was still alive in the morning. Phew! A few weeks later, the same thing happened… and then again, a few weeks after that. Only, the third time it happened, I thought back to what I’d been doing beforehand. It turned out that I wasn’t dying (!) but I had enjoyed two glasses of Merlot the nights before I had woken up with a rapid heart rate. I asked on the very trustworthy Fructose Malabsorption Support Group whether anyone there knew anything and two words were thrown at me: histamines and sulphites. Histamines are a a biogenic amine that occur to some extent in many foods, in addition to being produced endogenously by mast cells; histamine is degraded by the amine oxidase class of enzymes – if this enzyme activity is reduced, histamine levels can accumulate and allergic-type reactions can occur. Sulphites are a common food preservative, which some people develop a sensitivity to over their lifetimes, the cause of which is unknown. My money is on histamines, as I am yet to have a problem with white wines but red wine apparently contains anywhere from 20-200% more histamine than white wine, whereas white wine usually contains more sulphites than red wine (thanks, Wikipedia). Whichever it is, I do know that I can drink about half a glass of red wine safely, definitely not more than one. Stupid body! 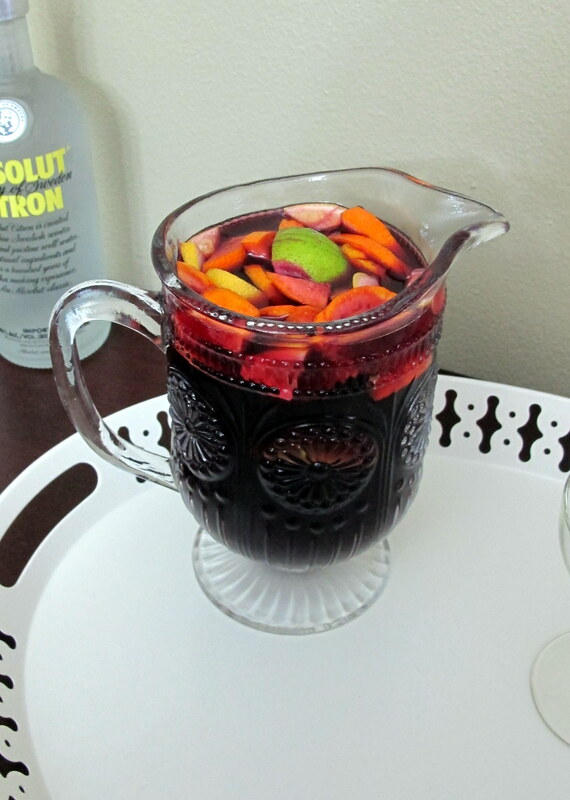 So, this is where sangria comes in. The sangrias I have had in the past were 1:1 red wine and soda water, among other things, so half the amount of whatever it is that makes my body react. Ergo, I can drink twice as much. Yay! It is best to make this at least 4 hours before you plan to serve it, I normally make it in the morning, so the flavours have had time to mingle together and settle down. 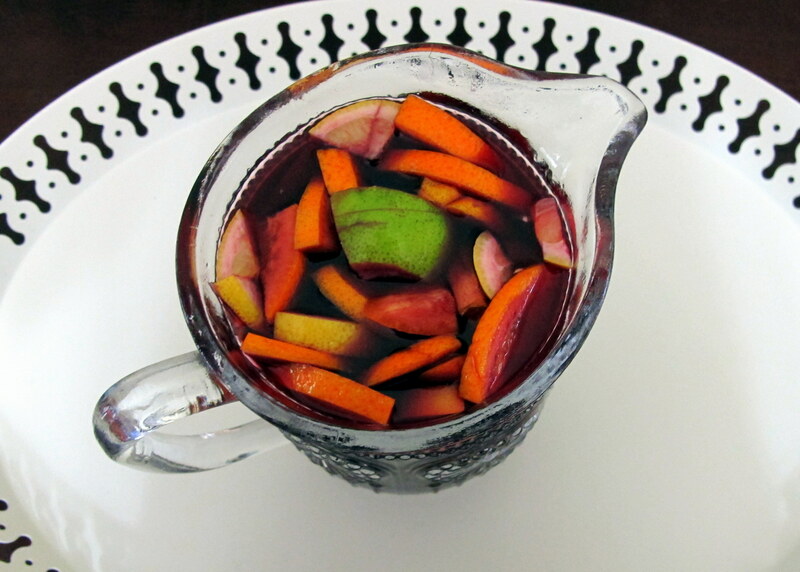 A traditional sangria originated in Portugal and Spain and contains red wine, a little brandy, chopped fruit and a sweetener of some sort (honey, castor sugar, orange juice). Brandy is NOT FODMAP friendly, so I replaced it with vodka. Feel free to use brandy if you can. I looked up quite a few different recipes to create this one, and I liked the use of triple sec to enhance the orange flavour. I do not know if it is strictly low FODMAP but there is only a small amount in there. If anyone knows anything different, please let me know. I only used low FODMAP fruits – orange, lemon, lime… if strawberries were cheap, I would probably have diced some and thrown them in, too. I used soda water/club soda to add some fizz and also reduce the histamine content… though the vodka helps to get the alcohol percentage back up a little bit, maybe I should have made this brew a little more potent?! Haha. Dextrose helps to balance out any excess fructose that might occur due to the red wine or triple sec liqueur. Like white wines, the dryer (less sweet) the red wine, the lower it will be in FODMAPs. Choose a bottle that is nice but not expensive, as I’m sure that some would count that as an offense to the Wine Gods. If gluten is an issue, make sure you choose gluten free spirits and liqueurs. As always with the low FODMAP diet, everyone is a little different. 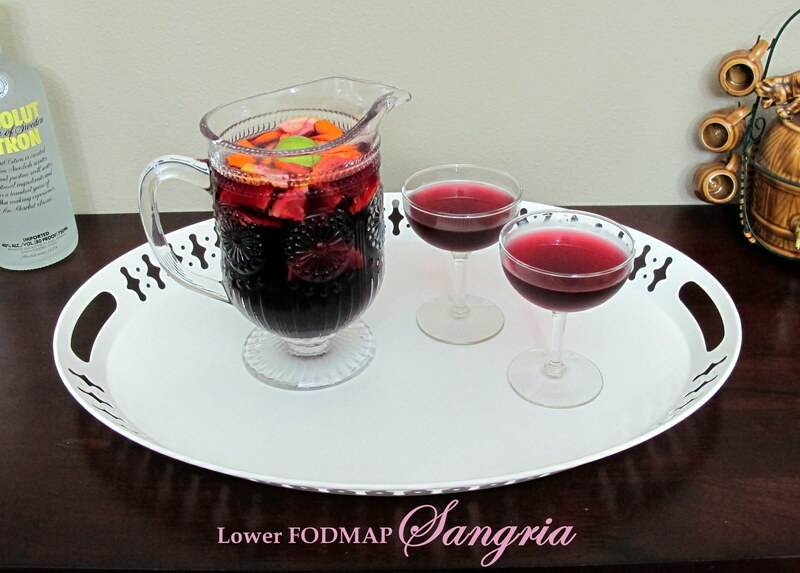 If you are just trying out wine or a sangria for the first time, take it easy and just have a small serving. 1 x 750 ml bottle of a red wine that you tolerate. Pour the vodka, triple sec, fruit juices and dextrose/castor sugar into the jug you plan to serve it in. Thoroughly mix until the dextrose/castor sugar has dissolved and then pour in the entire bottle of red wine, before mixing once more and adding the sliced fruit. Refrigerate for at least four hours, I normally leave it for eight. 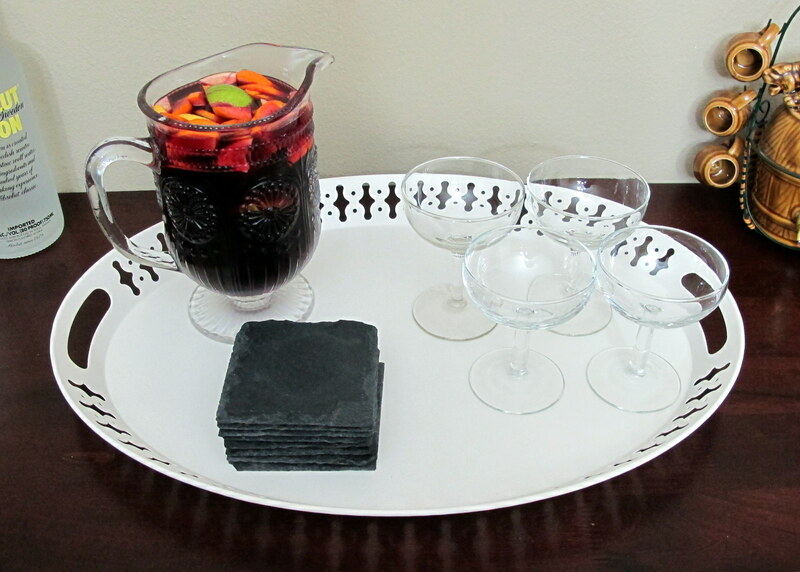 Just before you are ready to serve the sangria, pour in the chilled soda water and give it a gentle stir. Sit back and watch it disappear! I made two batches of sangria for a dinner party a couple of months ago and they were both gone in under an hour and a half, between 14 people.